A compression fracture is the collapse of a bone, particularly the vertebrae. Although compression fractures can occur in any bone in the body, they are most troublesome and painful when they occur in the back, often resulting in lower back pain. 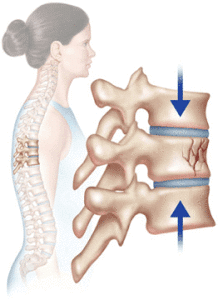 Compression fractures of the vertebrae are can be caused by trauma, osteoporosis, or cancer. While XRays can determine whether a compression fracture exists, an MRI can determine whether it is new (acute) or chronic (old). A compression fracture that has fluid and swelling in it is considered new and may be amenable to effective minimally invasive, interventional treatment, such as a kyphoplasty and vertebroplasty. A compression fracture that does not have fluid is thought to be old and is usually treated conservatively with analgesics. 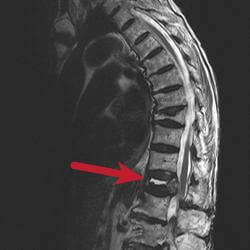 If the fracture is felt to be unstable, the spinal cord may be at risk of damage and surgical treatment is required. The pain from compression fractures can arise from a number of sources. First and foremost, the fractured vertebra causes back pain. 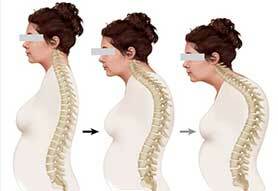 Activity cause subtle movements of the fractured vertebra, which can be extremely painful. 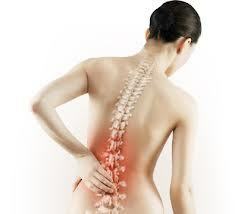 Fractures in the lower back cause pain, numbness and tingling in the in the legs (Sciatica). Finally, compression fractures also cause the spine to be out of alignment, causing spasms and strains of surrounding muscle. This will result in muscular back pain directly around the area of the compression fracture and may limit the range of motion in the back. For compression fractures of the midback, a condition called kyphosis arises in which multiple vertebrae compress and this can lead to an abnormal forward curvature of the spine. The neck must be extended in order for the head to face forward, which can result in neck pain. Multiple compression fractures of the midback can lead to loss of height, breathing issues, and digestive problems due to the decrease in space for the internal organs. Osteoporosis is the leading cause of compression fractures and lower back pain. In this condition, the calcium slowly leeches from every bone in the body, including the vertebrae. Since these bones support much of the weight, they are particularly susceptible to compression fractures. An acute compression fracture should be suspected in people, particularly women over the age of 45 years or men over the age of 50 years who develop the sudden onset of back pain, usually lower back pain. Other symptoms include worsening back pain with standing or walking, improvement of pain with lying on the back, limited spinal mobility, height loss, forward flexed deformity and associated disability. It can occur with fairly routine activities such as opening a window or as a result of a fall. Compression fractures can also occur in any age when a trauma has occurred. They also can happen with cancers that affect bone such as multiple myeloma, lymphoma, breast and prostate. About two-thirds of spinal compression fractures are never diagnosed because many patients and families think the back pain is merely a sign of aging and arthritis. In these cases, compression fractures may be diagnosed in the chronic state. Most people with compression fractures present to their primary care physicians first, or are seen and diagnosed by an emergency room physician. Radiographic images, particularly the MRI, can determine that a compression fracture is present and its relative age. 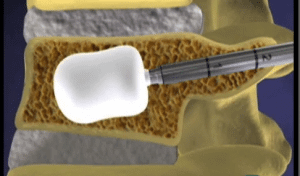 The treatment plan depends on the age and type of compression fracture present. Our Pain Medicine physicians have a wealth of treatments in their arsenal to treat compression fractures. 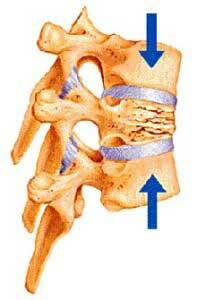 Kyphoplasty and vertebroplasty are two procedures that can be employed. Both are minimally invasive and excellent for the treatment of back pain due to compression fractures. Vertebroplasty involves the injection of cement into the vertebra with the compression fracture, fixing the bone, so that bone pain is relieved almost immediately. Kyphoplasty includes the additional step of inflating a balloon inside the compressed vertebra in an attempt to restore the height of it. The cement is then injected into the hollowed out portion of the vertebra, allowing easy filling. Both are very effective for back pain relief, and many patients experience substantial pain relief within a day from the procedures. If the compression fracture is not amenable for vertebroplasty or kyphoplasty or if there is persistent pain after the procedure, such as nerve pain, the Pain Medicine physicians can prescribe medications to help control the pain which can allow for more effective physical therapy. 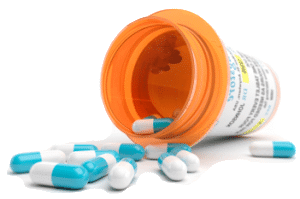 Anti-inflammatory medications, such as ibuprofen, can help to decrease the pain and swelling that occurs around the fractured vertebrae. When nerve pain is involved, antidepressants and anti-seizure medications are helpful in decreasing the shooting, tingling pain in the extremities. In treatment resistant cases, opioid pain medications can be used, but they are only considered after rigorous patient screening for potential dependency problems. Injections are also helpful, and this includes epidural steroid injections to treat radiating nerve pains or trigger point injections to treat spasm of muscles surrounding the compressed vertebra. Back braces can provide some stability to the spine and thereby reduce pain. However, back braces are most effective when the fractures are the lower back (lumbar spine) or in the lower portion of the midback (thoracic spine). Physical therapy is important in maintaining range of motion and promoting strength and flexibility of the soft tissue. Many physical therapists can help with the fitting of alternative therapies, such as massage and acupuncture, can help with the chronic pain from kyphosis, and they are a great adjunct to more traditional conservative and aggressive treatments. Rarely, when compression fractures fail to respond to these treatments or are severe enough to cause spinal instability, patients may be referred to a spinal surgeon for fixation with rods or plates. For patients who suffer compression fractures as a result of osteoporosis, it is important to supplement the diet with calcium to maintain bone density and to take bisphosphonate medications, such as Fosamax, to help prevent further calcium loss from bone.